Fiber optic broadband is sweeping the nation. Fiber's advantages over copper include faster speeds, durability, and efficiency. Internet Service Providers (ISPs) are going the extra mile and converting their extended networks to fiber, as more consumers are choosing fiber over DSL. Alden's fiber series will explore what fiber is, how it is deployed, and what the future looks like for fiber broadband service. We talked with Chris Burton, Alden’s OSP manager, who was able to provide a first-hand perspective of what fiber is like in the field. Optical fiber is made of tiny strands of glass, each slightly thicker than a human hair, inside an insulated casing. 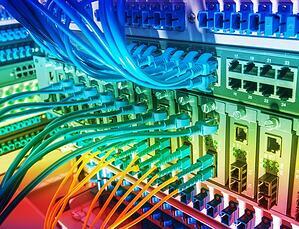 Fiber cables transmit data by shooting tiny pulses of light through the cable (hence the name optical fiber). Fiber cables are designed for long-distance reach and facilitate host high-performance data networking, providing high bandwidth and the ability to transmit data farther than copper cables. According to Burton, the switch from copper to fiber is revolutionary technology. Burton works in the Northwest, yet our phone interview was conducted from Alden’s Birmingham, AL office. He explained that every part of our conversation ran through fiber, cable to cable, from Alabama to Oregon. This Forbes article explains it well: “about every 40-60 miles, the connection needs to be re-amplified, or boosted, at an in-line amplification shelter.” Those shelters add up to a considerable cost, but the companies banking on fiber consider the expense worth the cost. There are several factors that distinguish fiber from copper. Fiber cable carries a high capacity of network bandwidth. In fact, its capacity is so great that some people in the broadband business have described it as “future proof.” While fiber does not move information at the speed of light, research shows it transmits only 31 percent below that speed. Existing fiber cables are equipped to handle data flowing at much faster speeds than those required by other technologies. Fiber can transmit data over much longer distances than copper, and can also be submerged in water. Fiber does not require as many signal boosts as copper. Light moves fast, and fiber cables transmit data through light created by lasers or light-emitting diodes (LEDs). As distances increase, the degree of signal loss is many times greater for copper than fiber. Fiber is less prone to interference. Since fiber carries no electrical current, these glass cables avoid most of the typical electromagnetic interference that can be a problem with copper cables. That makes it much less problematical to place them close to other cables. Fiber is safe. It doesn’t conduct electricity, so the danger of fire and electric shock is greatly reduced. Techs working with fiber should take precautions to protect their vision from strong pulses of light and avoid contact with tiny glass splinters. Fiber is more secure. Signals through fiber cables are more difficult to tap than those transmitted through copper. If a fiber connection does become compromised, it is also easier to identify. Fiber is durable. Copper can withstand roughly 25 pounds of pressure without being damaged, however, fiber holds up to four to eight times that amount of pressure, making it much less likely to be damaged during routine joint use operations. How Widespread is Fiber Coverage? Statistics from late 2017 showed that a quarter of U.S. households had the option of full FTTH (fiber to the home) connections, and more than half of those households had taken advantage of the opportunity. Coverage varied widely from state to state, from single-digit percentages in several states to 85 percent coverage in Rhode Island. These numbers are constantly growing. As the technology evolves, uses of fiber optics are extending far beyond telecommunications and broadband. Optical fiber is now used in medical settings, such as surgery rooms. It can be used for SONAR and seismic uses, and much more. Fiber’s capacity, reliability and durability make it an obvious choice for expanding and upgrading networks. While construction costs can be substantial, long-term maintenance costs are much lower. Consumers are realizing fiber can deliver the improved internet service they demand. The advantages of fiber mean heavy deployment in the coming years. For the joint use community, this will likely result in a high volume of permitting applications, One Touch Make Ready (OTMR) requests, and data entry. Joint use owners must be certain that asset data is easily accessible and accurate, as companies attempt to deploy fiber residentially or commercially. Many asset owners and attaching companies are searching for new ways to get ahead of upcoming fiber deployment. Spreadsheets and multiple disparate systems are becoming obsolete—they are no longer working for their users. Joint use departments across the nation are switching to a system that works for them and with them. A joint use platform promotes clear communication between joint use partners and helps efficiently manage new and existing joint use data. Several joint use owners and attaching companies have made the switch from spreadsheets and outdated systems to a joint use platform. The platform is allowing users to work smarter, not harder. Click the link below to schedule a no-cost, 15 minute consultation with one of our product managers to see if a joint use platform is right for your business.